THE Greeks no longer smash plates during a good night out - instead, since the 1970s legislation which now makes it forbidden, they are more likely to toss some flowers or napkins at one another in celebration. And did you know olive oil forms the basis of the triangular Cretan diet (meat and fish at the top) and, as well as its other health benefits, is a recognised aphrodisiac? These two facts are just some of those I learned on my Cretan holiday. You see, as the good professor once told me, Crete is like a bikini. You might think you can see it all, but the best bits are always hidden away from those but the most curious of eyes. 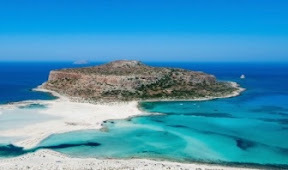 A week in Crete, the largest of the Greek islands, is just not enough to delight in the many thrills it has to offer. From the myths and legends of the Minotaur and its associated labyrinth, and Gods like Zeuss and Poseidon, to the history of the Minoan civilisation and its place as the important 'first link in the European chain' to it's current status as a front runner in eco-tourism and ambassador for the healthy Mediterranean diet, its DD cup runneth over. Located by the Agean sea - so named after the myth of the King who drowned there- it also offers more pleasant aquatic opportunities by way of cruising, scuba diving, snorkelling, and wind surfing as well as beaches like Elafonissi. And for those with a fish phobia, like me, who prefer a piece of glass between them and the creatures of the deep, the Thalassocosmos-Aquarium, a former American base at Gournes will prove an exhilirating experience in less intimidating surroundings. Here you can stare eyeball to eyeball at over hundreds of species and thousands of living organisms from the humble Octopus to winged fish, sharks and seahorses. The largest city in Crete is Heraklion and direct flights from Glasgow or via London will bring you straight into its central airport. Catering for families and couples, as well as those who just want a retreat from our ever bustling cities, it is mountainous and picturesque, with little fishing villages and harbours to break up the landscape. You are more or less guaranteed 13 hours of sunshine a day during August, and the temperature still hits the mid-20s in October. My particular experience was of the five stars on the island - of which there are many, but those with a more limited budget will find plenty including some lodges at places like the eco-friendly Millia Village priced at around £75 a night. A stay at The Aldemar Royal Mare Thallasso was a real treat - a refined yet sumptuous five star with an olde world attitude towards service and quality and an adjoining spa. 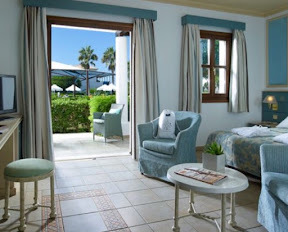 The nearby oppulent Minos Palace hotel offered real style and sophistication and some rooms even come with a private pool. Tourists love a good night out and The Cretan Village in Karouzanos is up a windy cobbled footpath where food, drink and dancing awaits - not to mention the odd donkey. Romance is very much alive and as the raki - grappa wine- goes down, you may find yourself getting amorous with... anyone! Near the main city of Heraklion lies the world famous Knossos, the largest Bronze Age archaeological site on Crete, restored, by archaeologist Arthur Evans who had an educated if not imaginative mind. With its frescoes and restored interiors it undoubtedly brings alive some of the late Minoan relics. A visit to the Archaelogical Museum of adjoining Chania showcases some of the artifacts removed during the excavation work. 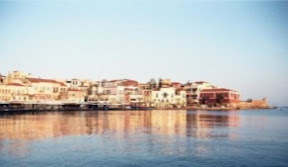 Chania also boasts a pleasant harbour by which to walk at night and an imposing lighthouse, and nearby is the serene Cavo Spada hotel - a modern retreat with a pool so large the lifeguard needs a boat to get from one end to the other. For budding historians, a trip to the Melidoni Cave with its rudimentary prayer altars proves haunting. A monument to those burned alive in 1821 forms the centrepiece of these caves and somewhat eerily the pictures I took here depicted facelike forms etched in the walls, soi much so that I had to seek comfort in some of the local food - of which pastries are a speciality. Crete has so much to offer so who needs plates? You'll find a holiday in Crete smashing in so many other ways. Theshowbizlion.com was a guest of the Greek National Tourism Organization.